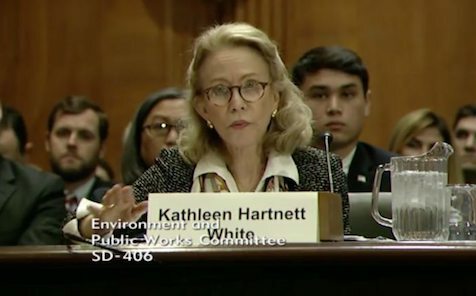 WASHINGTON – The Senate Environment Committee today approved President Trump’s nominee Kathleen Hartnett White, a Texan, to chair the Council on Environmental Quality. The 11-10 party-line vote reflected Democrats’ unhappiness with White’s skepticism on climate change. CEQ serves as a White House clearinghouse for actions at many federal agencies that affect the environment. It administers the 1969 National Environmental Policy Act, which requires environmental impact statements for major federal actions. Technically, her nomination is only to serve on the three-member CEQ, but Trump is expected to designate her as chairman if and when she is seated. During her confirmation hearing Nov. 8 (video archive), White expressed doubt not only about man-made climate change, but seemed to question some basic laws of physics. This drew a letter from some 300 scientists objecting to her nomination. As big an issue at her confirmation hearing, however, was ethanol – whose use in vehicle fuel is mandated by law under the Renewable Fuel Standard. As an oil-state official, White had previously criticized the ethanol mandate. But under harsh questioning from GOP corn-state senators, she backtracked, genuflecting to ethanol. Despite her committee approval, White’s path to the Senate floor could still be a long one. Democrats, if they stay united, can still delay cloture on the nomination (the cutting off of debate). That would burn up time the Senate doesn’t have until after it addresses the tax bill and a spending bill to prevent government shutdown. A final vote might be delayed until 2018. Other contested Trump nominees (for example, William Wehrum to be EPA’s air chief) have squeaked through Senate floor votes.